The island of Sipadan is regularly ranked amongst the top ten dive destinations in the world. This small rainforest covered tropical island situated in the Celebes Sea off the east coast of Sabah, is believed to have been formed by live corals that grew on top on an extinct volcano that rises 600m from the seabed. 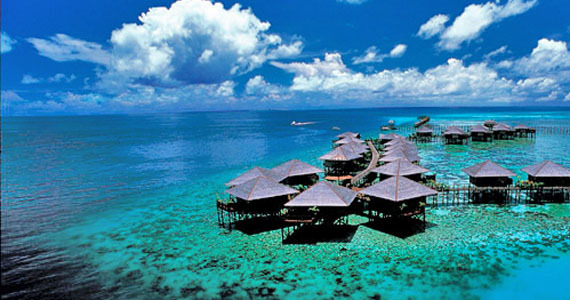 Sipadan is Malaysia’s only oceanic island which rises directly from the seabed rather than the continental shelf. This unique position of Sipadan places it bang in the midst of one of the richest marine habitats in the world. In fact the island of Sipadan is renowned for its rich biodiversity and it is said that the gorgeous waters around the island are home to more than 3000 species of fish as well as hundreds of species of coral. Additionally, these azure waters that envelop the island are known to have a year round visibility of almost 20 meters though this visibility has been known to reach as much as 50 meters during the dry season. The island itself is covered by much dense rainforest vegetation and boasts of several white sand beaches. The many delights of the marine wonderland, Sipadan can be easily accessed from the town Semporna, located just 35 kilometers north of the island. An hour long boat ride from Semporna transports you to Sipadan but before you embark on your journey to spot schools of hammerheads, reefs of colorful angel fish, various species of turtles menacing barracudas, manta rays and more ,you need to acquire a permit to visit Sipadan. Sabah Parks, an arm of the Sabah Government strictly regulates the arrivals on the island in order to preserve its environmental integrity. The resort that you choose to reserve for your stay on the island,will apply for this permit on your behalf. The Sabah Parks department allocates a total of 140 permits a day, which are shared by all the resorts on the island. Once you have been permitted to enter Sipadan, you can also venture out to the neighboring dive sites of Mabul Island and Kapalai Island, both of which have their own portfolio of marine attractions. Scuba diving is offered year round at Sipadan Island. However, if you want to have a truly unique experience, wherein you get to enjoy visibility of up to 50 meters in the waters around the island, you should try and schedule your visit for the dry season between March and October. During this period surface temperatures on the island range between 21° C to 32° C (70°F to 90°F) and visibility in the water is unending. Sipadan Island offers a dozen dive sites, each of which has its own unique characteristics. The various dive sites at Sipadan Island include White-Tip Avenue, Turtle Patch, Staghorn Crest, Lobster Lair, Hanging Gardens, West Ridge, North Point, Sipadan Jetty, Turtle Cavern, Barracuda Point, South Point and Mid-Reef. Each of these sites offer sightings of a variety of fish like barracudas, white-tip reef sharks, parrot fish, triggerfish, eagle rays along with various species of hard and soft coral and turtles like green and hawksbill turtles. The Turtle Cavern is one of the most eerie dive sites at Sipadan. This underwater limestone cave is a labyrinth of tunnels and chambers that are filled with the skeletal remains of turtles. It is thought these turtles drowned here after losing their way in the cavern. The deeper waters around Sipadan Island offer divers a chance to spot grand pelagic creatures like hammerhead, thresher and whale shark who reside at the bottom of oceans. If you have a fondness for scuba diving or even snorkeling, you should plan on including Sipadan island on any trip to Malaysia.